Echinacea is a profusely blooming perennial flower. Also called purple coneflower, the large, daisy-like purple flowers bloom all summer long with very little care. The large cones of seeds attract winter wildlife, such as birds, to the garden while adding winter interest to the yard. These flowers quickly establish themselves in the garden, returning each year without any effort from you. Starting echinacea plants from seed is the least expensive way to add these flowers to the garden, and it doesn't take much more work than purchasing transplants from a nursery. Prepare a garden bed that receives full sun in spring. Lay a 2- to 3-inch layer of compost over the bed and till it into the top 8 inches of soil to improve drainage and soil nutrition. Sprinkle the echinacea seeds on the soil surface once the soil reaches a temperature of 55 degrees F in spring. Echinacea seeds are small, so strive to sprinkle about three seeds per inch. Mist the garden bed with water as needed to keep the soil surface moist but not soggy. Do not use a sharp spray of water, as this may wash away or bury the seeds. Echinacea germinates in two to three weeks. Cover the bed with 1/8 inch of soil once the seeds begin to sprout. Echinacea needs light to germinate, so do not cover before seeds have sprouted. Thin the echinacea to 2 feet apart in all directions once the seedlings are 3 inches high. Pluck out the extra seedlings and dispose of them. Not all the seeds germinate, which is why over-sowing is necessary. Echinacea grows well in most climate zones and is fairly tolerant of differing soil types. 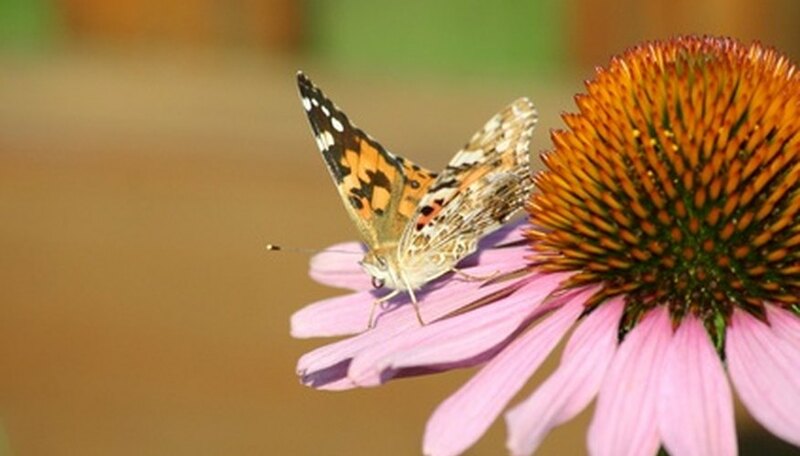 Echinacea is often planted in butterfly gardens, as it attracts many of the attractive insects. Echinacea does not compete well with weeds. Weed the bed regularly or lay a 2 inch layer of mulch around the plants to prevent weed growth.